Brand new Doug Rappoport Knaggs Kenai T2 with a beautiful Teal Fade bound maple top that perfectly compliments the modern contours of the body, while providing loads of resonance and sustain. Doug Rappoport's signature combination of Seymour Duncan pickups and a mahogany neck and body are capable of getting you all PAF tones you seek, and the versatility is taken a step further with the on board kill switch! If you haven't had the chance to experience a Knaggs guitar, you are really missing out. They are built the right way, one at a time. Joe had 20 years with the Private Stock department of Paul Reed Smith, and Knaggs is the next generation of custom creations. Larry Breedlove and Steve Henderson had a dream: to build instruments unlike any others. In 1990 they set out to craft lightweight, responsive, and impeccably crafted guitars featuring innovative designs, unique materials, and distinctive aesthetics. Kim Breedlove soon joined the team and the company grew as players discovered the amazing tone and beauty of Breedlove guitars. The company has grown and changed over the years but the spirit and dedication is the same. Breedlove guitars are better than ever and look and live up to the standards original set for the company decades ago. Don has always liked building things from the ground up. 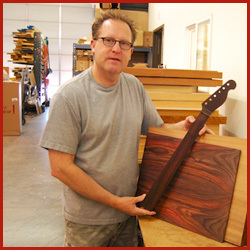 He joined Valley Arts guitars in 1985 where he ran the shop as foreman. 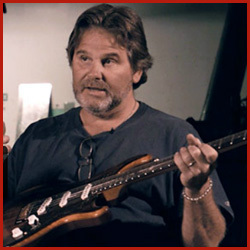 He created instruments for some of the biggest artists of the time including Lee Rittenauer and Vince Gill. 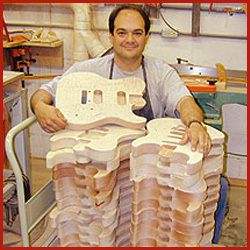 In 1993 he decided he wanted to build a guitar with the best tone, looks, and playability. From the ground up, he designed several pieces, and also improved on other iconic guitar designs. 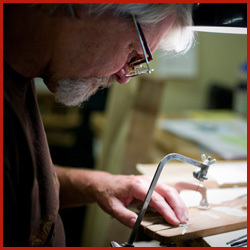 Decades later, Don is still focused on making everything by hand, from parts to pickups. Originally founded in 1974, Music Man built its name leading an industry revolution, introducing active electronics on its production instruments. As part of the team during the 70’s, Sterling Ball played an important role on the design and development of the iconic StingRay basses. Officially purchasing the company in 1984, Sterling, joined later by his sons Scott and Brian, has built a team of dedicated professionals who collectively share a common goal: building the highest level of hand-crafted instruments available. The company continues to grow and innovate building some of the finest guitars in the US. Doug Kauer has had a lifelong exposure to both mechanics and woodworking. Doug grew up in his father's cabinet shop and was building race cars from the age of 10. It seemed only natural that one day Doug would combine his passion for playing guitar with his skills with wood. Doug's outsider approach has lead the way, combining sustainable tonewoods, vintage personality with modern functionality. With artists such as Walter Becker, Scott Holiday, and more, Doug has found a formula that works. Michael Tuttle's background includes lengthy stints with Valley Arts and Don Grosh Guitars, where, among other things, he gained a reputation for his fretwork. After 10 years of honing the art of guitar building working for other organizations it was time to start out on his own. 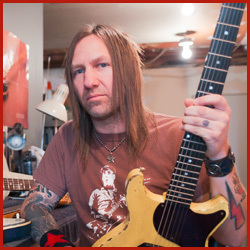 Michael Tuttle Guitars began in 2003. His craftsmanship and quality are unparalleled. Once you've played a Tuttle you'll know! Michael makes the necks feel like they're a part of your hands from the moment you pick them up. Red Rocket makes totally custom guitars one at a time, built to your exact specs using best materials and components, Private Reserve level woods, vintage tone caps, custom wound pickups, custom binding and purflings, and that's just the start. They mix the best contemporary guitar building techniques with a vintage vibe to create modern classics with roots in the golden age of guitars. 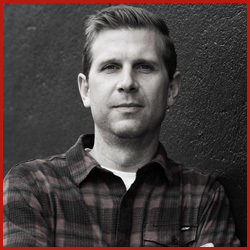 Matt Nowicki is insane (in a wonderfully creative way) and his stuff captures all the details of vintage with a healthy does of modern flair. While looking for a pickup with vintage tone, Nick Sorenson stumbled across someone who was building SRV #1's from 60's strats and thought, "Hey! I think I could do that". Rocketfire brings the best of vintage Fullerton with the comfort and stability of a brand new guitar. Premium hardwoods are selected with weight and tone in mind, and every fingerboard is tap tested to ensure you're getting the very best. 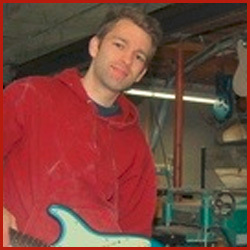 Nick is driven by passion and craftsmanship building the for the most tone conscious musicians. Scott had an interest in electronics at an early age and in his early teens he began playing guitar and experimenting with pickups. 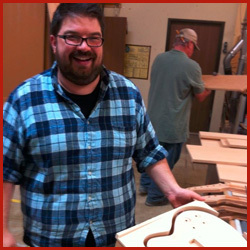 His tinkering landed him a job carving over 1000 necks alongside luthier Richard Hoover of Santa Cruz Guitar Company. He honed his skills on every aspect of building and developed a guitar for the 21st century. After meeting musician Barry Sless he began to develop a guitar with the broadest tonal range, thus starting Walker Guitars. Scott builds everything by hand, including his cases. Terry built his first guitar back in 1977 and the rest is history. 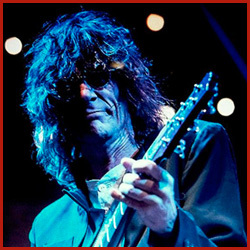 Since then he has honed his skill building guitars for greats like Jimmy Page, Eric Clapton, and many other fine players. 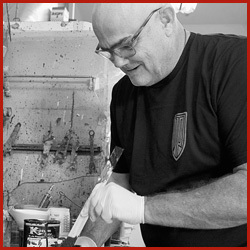 Like many builders, Terry's introduction into luthiery came from repairing and restoring. As a lifelong musician Terry learned the shortcomings of guitars both new and vintage and began building instruments with a level of quality and tone that blew people away. Terry continues to produce some of the nicest instruments out there. 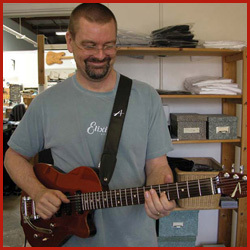 Joe Knaggs former head of the Private Stock Department at Paul Reed Smith Guitars, and the head of R&D while there, launched his own brand in 2009. The PRS aficionado will recognize some of the familiar lines and Joe continues to push the limits of Lutherie. Only the finest tone woods and materials are being used in their designs, which are highly anticipated by aspiring guitarists and collectors around the world. Joe is considered by many the best luthier today, and this notability is well deserved. 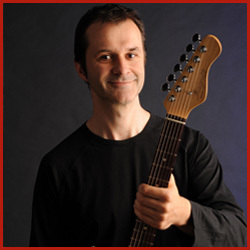 Christian Hatstatt grew up in Alsace, France with a strong passion for music, lutherie and foreign cultures. He believes in pure, clean lines and original designs which shows through in every guitar he makes. Teaming up with his old friend Kei San and a team of the world's finest luthiers Magneto Guitar's is able to turn out top notch instruments that are truly handmade start to finish. He continues to strives for inspiration, integrity, and positive change. Gerard Melancon comes from 3 generations of music and guitars, and that passion has been with Gerard through his entire life. He got his start as a session guitarist who required more versatility than current big box guitar manufacturers offered. Years later Gerard's work has spanned several years and is known for his impeccable craftsmanship and having one of the best ears in the business. His instruments have a soul all their own, and every time we pick one up we feel his inspiration. Palir Guitars is owned and operated full time by husband and wife John & Katie Palir. Since 2012 they have been providing nicely worn instrument with unmatched comfort, tone and playability. When someone plays a Palir Guitar they often are immediately drawn in by the comfort and smoothness of their necks, as well as the clarity of pickups, and overall sustain of the guitar. A special aging process for their necks leaves them with a spectacular play feel and the relic work on the bodies are visually stunning. Palir guitars are a perfect mix of classic styling with a modern touch. 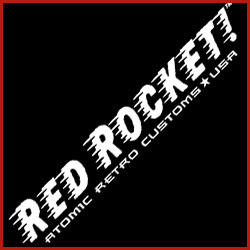 Rock N Roll Relics got it's start in 2005 after musician Billy Rowe stepped off the stage and into the workshop. Even at an early age Billy was always modifying and refinishing his guitars to get that perfect look and sound. After years of touring and recording, Billy knows what a guitar should feel and sound like. He has built guitars for Stevie D, Gilny Clarke, and done finish work for Joe Satriani He now crafts instruments that have the look and feel of a road worn workhorse and the sound of true Rock N Roll Relic. 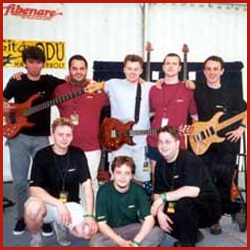 Prior to founding JS Technologies in 1997, John worked at Rudy's Guitar Shop in NYC, building his first guitar in 1984 under the Pensa-Suhr brand, a model which was made famous by Mark Knopfler. 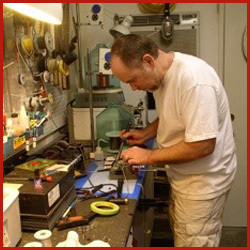 In 1991 he started building amplifiers under the Custom Audio Electronics name and during the mid 90's was a senior level Masterbuilder for the Fender Custom Shop. Today Suhr creates award winning guitars and amplifiers to exact specifications using a private cache of exceptional tonewoods. 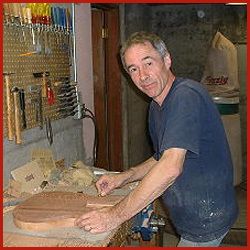 Roger Giffin started building quality handmade guitars in the late 1960's where they quickly gained acceptance and success. His shop was the place to buy the best in London. Regular customers included Pete Townshend, John Entwhistle, Eric Clapton, and many others. 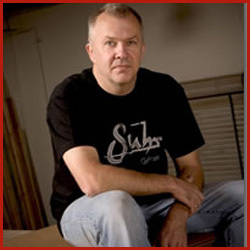 He then took the role as the head of Gibson's Custom Shop building for the likes of Eddie Van Halen and Jimmy Page. Roger's legacy has carried over to his own brand as he continues to build some of the best instruments in the world. 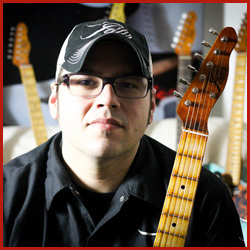 Tom Anderson has had the same vision for the last 28 years, “We are a small American Company dedicated to creating the world's finest feeling, playing and sounding electric guitar—period!” Tom also loves it when his guitars look good, and they certainly do that—but, without sacrificing any playability or sonic depth. That's one of the keys: no frills or trendy gismos before tone and flawless function. Everything has to flow with excellence and grace—all working in “concert” for the whole, bringing forth the best playing experience imaginable. With great honor and reverence to traditions of the past, we want your new Anderson Guitar to be your best guitar, by far—no comparison. 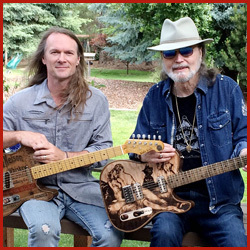 With over 75 years of designing, building and playing experience, Terry Martin and Ken Melhus combined their talents and started the Walla Walla Guitar Company. WWGC goal is to create instruments that are visually exciting, unique, and play like an old friend. Besides creating new takes on classic guitars such as the WallaCaster, they also have some truly innovative guitars like the T-Top (Tone-Top) with options never before seen on a guitar. The T-Top is able to be visually personalized as as much as you like. Every guitar from Walla Walla is truly one of a kind.